The Gray Whale - subfamily Eschrichtidae, can grow to a length and weight of 15m (50ft) 30-35 tons for the female and 14m (46ft) 16 tons for the male. This whale is well known for the 19,500km (12,000 mile) round trip between its northern feeding grounds in the Beaufort, Bering and Chukchi seas and its southern breeding grounds in Baja California and off the Korean coast. Primarily a bottom feeder, the Gray will dive to 120m (395ft) deep, but prefers much shallower water. While feeding it stirs up clouds of mud from the seabed and from it's mouth during filtration. During this time the whale will mostly consume tubeworms and sessile polychaetes. While migrating the Gray will feed at the surface on small fish and shrimp-like mysids (Acanthomysis sculpta) but once the Arctic is reached it will consume it's main prey gammarid amphipods. Mexico set the precedent for Gray Whale habitat protection when the Whale Sanctuary in Laguna Ojo de Liebre, Baja California Sur was established by presidential decree. In 1988, the Vizcaino Biosphere Reserve was created to encompass two areas used by gray whales, Laguna Ojo de Liebre and Laguna San Ignacio. In addition to the establishment of protected areas for this cetacean, legislation prohibiting the harassment, capture, physical harm or killing of gray whales was also enacted in 1983 and 1991. 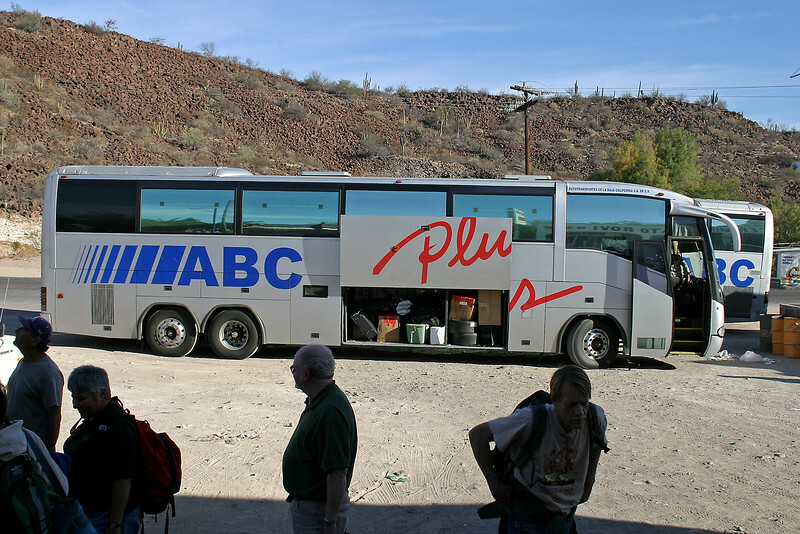 Shuttle from San Diego to Tijuana, where we boarded the night's Tijuana/La Paz bus. Stop close to San Ignacio.